While it's true that unipolar magnets can't exist, this isn't a problem for the Flat Earth. This is because ring magnets, which are shaped like (you guessed it!) a flat disk, are capable of having radial magnetization. In a radial magnet, one magnetic pole is at the center and other other is at all points on the edge of the magnet. A magnet like this can be found in loudspeakers, and perfectly replicates what is found on the Earth." This statement goes against the most basic laws of physics which anyone can easily replicate at home. 2) "are capable of having radial magnetization" - indeed, ring magnets are capable of having a radial magnetization, but there's a big thing missing from a flat disk-shaped earth, a hole in the middle. I have yet to find a map or anyone in real life who has proven the existence of a huge hole at the north pole. 4) "A magnet like this can be found in loudspeakers, and perfectly replicates what is found on the Earth." - the magnets in the speakers have no holes and have a "+" and a "-" side which are perfectly and conveniently placed on the exact opposite sides of the magnet. In conclusion with the physics familiar to mankind there is no way a flat disk can have a single north pole and then infinitely many south poles, all scattered around "the edge of the world". Magnets like this simply don't exist. If you want to prove me wrong, please conduct a scientific experiment taken place in a controlled environment (e.g. a lab), just like the classical 2 sided magnet has been proved to exist and function. i don't know if this helps in any way but i just seen this last week and now i find this post. This discovery seems really exciting indeed! For a science fan like me, it's really interesting! The only thing making me skeptical is that the articles are from 2014, and it's 2019 now. Why haven't we heard anything else about that? Discovery of a one pole magnet would be world-changing and as mentioned in the video "comparable to the discovery of the electron"! Very interesting indeed! But sadly I don't see any actual proof of that implying to the concept of the flat earth. It would be very interesting to hear about a unipolar magnetic field being discovered 5 years ago. It would also mean this Wikipedia page would have to be updated accordingly. I'm not exactly sure what you're saying here, but if I understand correctly, you've never seen a speaker magnet. They seriously have a north pole in the center and a south pole around the out side. Or it could be south on the inside and north around the outside. While speaker magnets are made from a normal two-pole sandwich oriented ring magnet, they have soft iron field forming pieces that form it into a magnet with one pole in the center and the other pole around the outside. I think the problem you're having is that you don't realize that magnets are made up of zillions of tiny "magnetic domains" i.e. many tiny tiny micro magnets. Normally, these are all pointed every which way and cancel out each other. But when a piece of metal is magnetized, these "magnetic domains" are lined up by a stronger magnetic field, and then they add together to form a magnetic field. In fact, some magnets aren't even metal! They are small metal oxide magnetic dust particles mixed with either ceramic (AKA Ceramic magnet) or rubber (Flexible magnets) in which case it must be obvious that the small magnetic particles could be oriented in whatever direction to form whatever overall pole pattern you liked. All permanent non-superconducting magnets are made up of numerous small magnetic domains *just like* if you were to get a lot of tiny magnets and arrange them to form one big magnet. Thus is is not only possible but common for a magnet to have a single pole in the center and the opposite pole around the out side. While you are correct about the orientation of the magnetic poles of a speaker magnet, it is still literally a ring magnet. It has hole in the middle. All of them do. A ring magnet must have a hole. The earth does not have a hole in its middle that I know of. Unless perhaps its guarded by security guards hired by the UN. Surely a ring magnet doesn't have to have a hole in the middle? If the middle was filled with some material which was, say, not metallic then it wouldn't stop the ring magnet from being a ring magnet, would it? AATW, good point. But are you saying the earth has a large plastic plug in the middle? Is it threaded nylon? No I'm not, but it doesn't have to be plastic, does it? I'm not sure what materials would be acceptable. The hole in the center of a ring magnet is irrelevant. The magnet could be made as one piece homogeneous magnet in the shape of a disk with one pole in the center and the other pole around the outside evenly distributed. The little micro magnetic domains don't care what the ultimate shape of the magnet is. In fact all kinds of patterns are put into rubber magnets - they use them in computer cooling fans, for shaft position encoders, and all sorts of stuff. I have attached a picture of a speaker magnet for you. The thin gap where the speaker coil used to go in has been filled with epoxy, but otherwise for all practical purposes it's a flat surface with one pole in the center and the other pole evenly distributed around the outside. While it is made from iron and a magnet, it could just as well have been made out of solid magnet - it's just that this was cheaper. If I were to stick this onto a piece of tool steel, and take it off, the tool steel would remain faintly magnetized in the same pattern, and it would be a homogeneous single piece solid magnet with one pole in the center and the other pole evenly distributed around the outside. Seriously, do a little research, please. This part of flat earth isn't an impossibility. Just of of curiosity, how would any of that explain the movements of the north and south geomagnetic (dip) poles that have been observed for the last hundred years or so? Tomfoolery, you are completely wrong. No disc or ring magnet can be radially magnetized. So says companies that manufacture magnets for a living. And before you post a link to a Chinese website toting a radially magnetized magnet - its bullocks. Its an approximation using sintered arc segments. Already read it and researched it. And, also take note - none of these approximated radial magnets are discs. They are rings. First of all, you have some faulty logic going on there. You are citing available products from the manufacturers of powerful magnets. It just so happens that making a center poled magnet super powerful is not practical because the machine that makes magnets has to an equal or greater magnetic field to form the magnets, and those machines have parallel charging magnets. The fact that commercial strong magnet manufacturers don't make a center poled magnet simply is not proof that they cannot exist. It just so happens that a weak center poled magnet is not particularly useful in industry and so nobody bothers making them. While they only show the non-center part of the charging coil on one side, it is clear that it is a weaker magnetic field over a larger area because it covers other bits and yet it doesn't erase them. Only the center pole point has enough strength to write data bits. And you saw the picture of my speaker magnet. It is a true center pole magnet as a unit, right? What if instead of being a ceramic magnet with steel pole pieces it was all made out of ceramic, or all made out of steel, why would it cease to be a center pole magnet? But even if you were to prove that a center pole magnet could not all be made out of the same material, you can see it can be made from a combination of iron oxide and iron. There's lots of iron in the earth. Who's to say it doesn't form a center pole magnet just like the iron in my speaker magnet does? However I love a good challenge, and I'll keep my eyes out for a free scrap of disk shaped tool steel that I can try to magnetize as a center-poled magnet. You obviously did not pay attention to what is in the links I sent. The key phrase is radially magnetized. The magnetic field lines do not and will not converge to a point, or in other words spread out radially from a single point. They practically say it cannot be done. 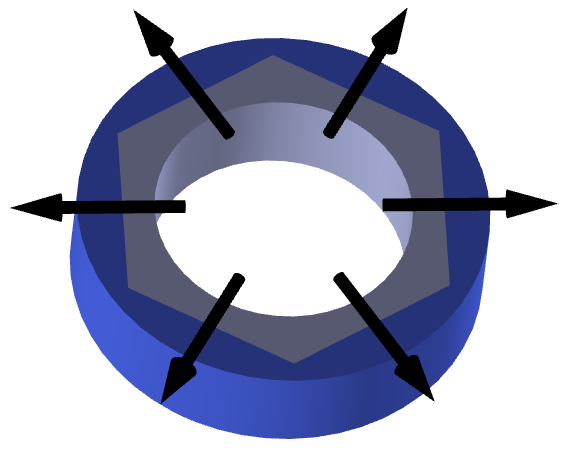 Even providing a graphic showing the misconception of a radial magnetization in a flat ring. Your hard drive example is faulty logic right in your own statement of "something very close to it." In other words, its not it. Throw some iron filings around your speaker magnet and find out what the magnetic field looks like. Its a ring magnet that has the north pole on the top layer and the south pole on the bottom layer. The north or south pole is not radially sorted on the inner diameter of the ring. I certainly did pay attention to what you sent - they didn't say it couldn't be done, they said that the curved magnets they sell are actually magnetized along a straight line, and that if you use them to make a circle you don't get a perfectly circular magnetic field. However, just because they don't sell a product doesn't mean it can't be done. As to iron filings, your wish is my command, oh great one! I found ample iron filings on the floor under the benchtop grinder and I slurped up some filings with my speaker magnet. Now who's gonna help me clean it up, lol? So I attached two photos. One shows how iron filings stand up on end on the ends of a regular N-S bar magnet. Then I attached one showing me speaker magnet with iron filings, and you can clearly see that the iron filings are standing up in the middle because there's a pole there, and standing up around the edge because the other pole is there. Now it's not a perfect example of the earth because a speaker magnet has a very narrow N-S gap around the center core where the speaker coil inserts. That's why there's nothing stuck to some of the face of the magnet. The iron filings stuck very strong to the N-S gap but it doesn't show in the picture. I could create a much more earth like model with a larger ring magnet I have but I gotta go run some errands in a bit so you'll have to wait on that one. But it really is possible to have a magnet with a pole in the center and the other pole around the edge. You are still wrong. Your ring magnet still operates the way I said it does. The cylinder in the center still has a north and south magnetic pole. The ring magnet has a top layer that is one pole, and the bottom layer is the opposite pole. It is not possible to have a single pole magnet spreading out radially from a center. This is evidenced by the fact that the iron filings on the outside of the ring are curved outward and down towards the other side of the ring magnet. See attached photo of a diagram I just drew. Excellent, you just saved me having to take another picture. Per your drawing, what if the air gap was zero? Then look at the face! You could have a north pole in the center, and the south pole all around the outside! So what if there's an inverted pattern on the other side, we're not on the other side so it doesn't matter what's on the other side. What matters is that it's entirely possible to have an earth with a magnetic north pole in the center and a south pole around the outside edge! You've just beautifully demonstrated it for us! My whole intention was to address what is in the WIKI. Which the OP graciously stated for us that the earth's magnetic field is radially oriented. What I have drawn is not radial. What you have is not radial. It is axial. This has been my point the whole time. Therefore, the Wiki is incorrect. You cannot have a radially oriented magnet. Yes, we can have what you describe, if you conveniently ignore the fact that the underside of the magnet has to exist, as well - which is what the Wiki would suggest with a radially oriented magnet. I apologize if my intention in my response was not clear. Of course, I thought the intention of any response to a topic is to the topic itself. You would still have 2 magnets. However, what you would not have is a south geomagnetic pole that wanders about around and off the shore of Antarctica like what is observed in the real world. You cannot have a radially oriented magnet. Surely you must realize that just because you don't have a radially oriented magnet it certainly doesn't mean you cannot have one. Really! Just because you don't have one doesn't mean you can't have one! And if you stopped to think about how magnets are made up of lots of tiny micro magnets called magnetic domains, you could realize that since any individual micro magnet domain can be in any angle, you could form any kind of magnet you like. I got a magnet with like 6 north poles and 6 south poles! But never mind that. They explain that if you use their magnets to form a ring, you do not get an even distribution because each magnet of theirs is not radially magnetized. However, it is sort of radially magnetized. Now put your thinking cap on and consider what would happen if you used a million thin pie slice magnets instead of 6 segments? You *would* get a radially poled magnet! And here's the clincher: Magnets *are* made up of millions of tiny micro magnets! If you don't believe me go do a little research. Furthermore, center-poled electromagnets are also common in industry, so who's to say the earth magnetic field isn't something electrical? If there are electrons circulating in the hot conductive lava deep down, that too would create a center-poled magnetic field. I really don't think we can conclusively state that radially oriented magnets cannot exist. That's kind of like proving the non-existence of something. I think a bigger problem would be that for a radially oriented magnet, the magnetic force at the center would be much stronger per square meter than it would be around the edge. The magnetic field strength on earth is supposed to range from 25 to 65 microteslas, so maybe it's 65 on the north pole and 25 around the edge?